Sometimes the simple things are the most satisfying. And yes, I am talking about cookies. In the Northeast, we all grew up on “deli” or “bakery” cookies. You know–those buttery, slightly crunchy cookies topped with sprinkles, chocolate or both. Simple, delicious and perfect with a cup of tea or coffee. These hamantaschen are reminiscent of my childhood favorite. 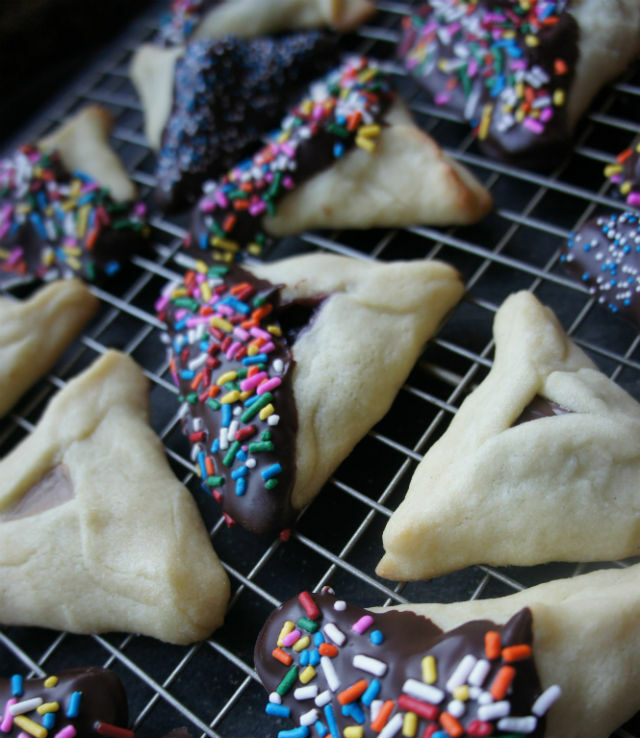 They are just simple hamantaschen, stuffed with the filling of your choice (jam, chocolate chips, nutella, poppy seed, whatever), but then they get a little fancy with a dip in some melted chocolate and a good dusting of colored sprinkles. Part hamantaschen, part “bakery” cookies and one hundred percent sweet and satisfying. Every time I make these hamantaschen, people ooh and aaah: simple taste, beautiful presentation. What could be better? Beat the butter and sugar together until smooth. Add egg, milk and vanilla until mixed thoroughly. Sift together the flour, baking powder and salt in a separate bowl. Add dry mixture to wet mixture until incorporated. Note: if the dough is too soft, increase flour amount by a few Tbsp of flour until more firm. Dust your work surface with powdered sugar or flour to keep from sticking. Roll the dough to about ¼ inch thick. Using a round cookie cutter, cut out and place onto cookie sheet. To keep the dough from sticking to your cutter, dip in powdered sugar or flour before each cut. Fill cookies with scant 1/2 tsp of speculoos in each round. Place cookies on baking sheet with silpat or parchment paper and place entire baking sheet into the freezer for 10 minutes before baking. This will ensure the cookie don’t fall apart while baking. Bake for 7-8 minutes. Allow cookies to cool completely. Place a piece of parchment on top of a baking sheet. Place bakng rack on top. Place dark chocolate and vegetable oil in a medium glass bowl. Heat in the microwave at 30 second intervals until melted. Mix until completely smooth. 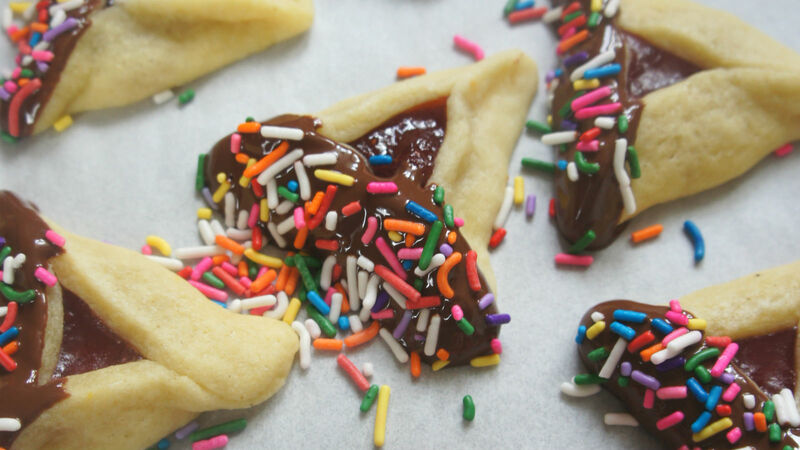 Dip hamantaschen halfway (or all the way) into the melted chocolate. Place on top of parchment paper. Top with sprinkles. Allow to cool and dry 2-3 hours before packaging or storing them.